Sensitive skin has special needs. 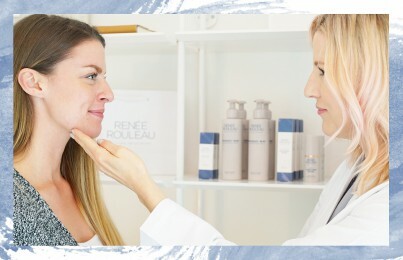 Skin care expert, Renée Rouleau offers tips and advice for keeping delicate skin calm. The binders that hold a bar of soap together are in an alkaline base (high pH balance) which will strip all the water and natural oils out of the skin, causing the surface of the skin to dehydrate and create sensitivity. Your skin cells need to stay moist in order to be healthy, and without water, acne conditions, sensitive and dry skins will be aggravated. 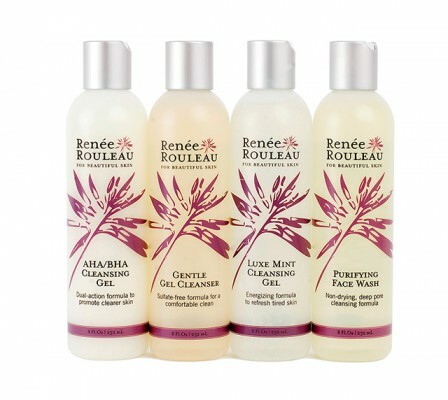 See the collection of Renée Rouleau gel cleansers and cleansing lotions. Especially in the summer time when it’s hot outdoors, the increase of blood flow can increase heat and sensitivity in the skin. Try keeping your skin care products in the refrigerator. Cleansing, toning and moisturizing with cool temperature products will constrict the capillaries to ease redness and irritation. Use skin care products with anti-inflammatory and calming ingredients such as chamomile, sea whip, azulene, and white tea to infuse a natural and beneficial comforting treatment for your skin. This popular treatment is beneficial for exfoliation, but for sensitive skin, it’s a no-no. Sensitive skin is caused from a weakened protective barrier that lets irritants penetrate and moisture escape. And because these treatments are designed to break down the skins barrier in an aggressive way, it will only aggravate sensitive skin. Instead opt for mild chemical peels or mild facials. See the chemical peels and facials offered at Renée Rouleau Skin Care Spas. Read: Are Laser Treatments And Chemical Peels Damaging Your Skin? Avoid eating spicy foods, drinking alcohol or spending time outdoors in hot weather, when you want to keep your skin looking calm. Also, when washing your face, use lukewarm/cooler water. If you have extremely sensitive and allergic skin, it’s always recommended to do a patch test for compatibility prior to using any new products. How to do a patch test: The best place to patch test skin care products is the side of the neck. This area is actually more sensitive than the skin on the face but a good place to test out any new products. Apply a small amount of product to the side of the neck, gently rub in and wait 24 hours. If there isn’t a negative reaction, you’re all set. Did you know the #1 cause of allergic reactions to skin care products is perfume/fragrance additives? At Renée Rouleau, we do not use artificial fragrances in any of our skin care products. Read: How Can I Lessen The Amount of Chemicals I Use On My Sensitive Skin? Did you know that dry skin causes tiny, superficial cracks in your skin? Ouch! This is why skin can be more sensitive and easily-irritated during the winter months, when the skin is at its driest. These cracks (also referred to as a damaged protective barrier) can be caused from over-heated skin, rosacea, the use of harsh products, and over-using exfoliating products. If your skin is dry, you must use barrier-repairing products containing lipid-rich oils to reduce skin sensitivity and dryness. See our Phytolipid Comfort Cream. Read: Is The Clarisonic Brush Harmful Or Helpful To The Skin? Pull out your skin care products and look at the ingredient labels. If any of the below ingredients are listed, we highly suggest you don’t use them. Read: When Is It Okay For My Skin Care Products To Tingle? 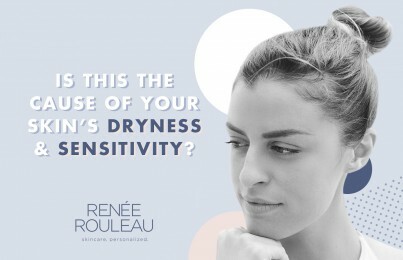 The bottom line: Sensitive skin conditions have been on the rise, but by treating your skin gently, you can significantly control signs of irritation and inflammation.